Tip: Shoot some asteroids to find some resources! Then you can begin trading with the various planets you will find. Fly around using the ARROW KEYS. Z and X are action buttons, and are shown onscreen based on context. Note: You can also play the game with a generic gamepad (like a NES style controller, etc). Note: Press CTRL+R if you want to Restart the game with a new universe. It's different every time you play. These can help you to make trading decisions -> buy low, sell high. I'm building this in PICO-8 and really enjoying it! It's a fun way to practice programming outside of my usual Unity + C# combination. It's something I like to work on when I clock off from other projects. I'll post updates as they come to hand. For each universe you go to, give 3 randomised missions for the player to do before they can go to the next dimension. ie: The player could have a set of 3 objectives to complete, then they get to go to a new dimension. You can achieve them in any order, and once one is ticked off, it's ticked off for good (so you don't need to maintain all three objectives at once). 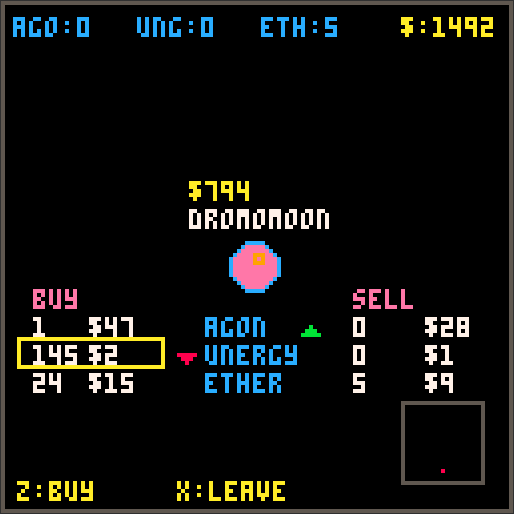 eg: "Obtain 300 Agon", "Obtain $2000", and "Make sure planet Alephron has 500 Unergy". Draw spaceship as a triangle with facing direction. Respawn asteroids occasionally, so they don't run out. Player should die if collide with asteroid. Make sure sound fx are harmonious with the music. Planets should build back up their money slowly. Prices at planets should adjust a bit based on what you buy and sell from them. Flying around should take a bit of Unergy, if you run out you fly slowly. Ship could have limited cargo capacity. Go to "space stations" to buy more cargo space. Thanks! :) Just started playing with PICO-8. Need to put in a shooting sound, add some background music, and add in some actual goals. Yeah ... good stuff. It reminds me of the game 'Homeworld', where you fly around in space harvesting asteroids, fighting bad guys and building a fleet. Fun game play. Rock on!